In the week that the first Radical SR9 received the ACO’s approval, we have confirmation that the fourth chassis has found an eager buyer – the van der Steur Racing team. Ben Devlin is signed up to race for the team in the ALMS in 2006, and any disappointment at not racing at Sebring is balanced by the prospect of racing a new Radical SR9 later this year. The new car should be thoroughly tested in time for its debut at Lime Rock in July. van der Steur Racing fitted its Lola with AER’s inline four cylinder turbo engine for 2005, so clearly that engine is the choice for the new Radical – which will provide a degree of familiarity as they step up to the latest generation car for 2006. Gunnar van der Steur will partner Ben Devlin at all the ALMS races this year (from Houston on May 12), with brother Erik joining in at Petit Le Mans and Laguna Seca. The team has made it clear that the transmission of the B2K/40 is too fragile to tackle the bumps at Sebring – but into the second half of 2006, the ‘light blues’ will have a totally new car to go racing with. Ben Devlin will have a chance to really show what he can do, from Lime Rock onwards. Before that though, the team’s B2K/40 will benefit from a slight restrictor size increase (up from 43 to 45 mm). The first two (Rollcentre) Radicals will be Judd-powered, with the third one, the factory car, AER-powered. 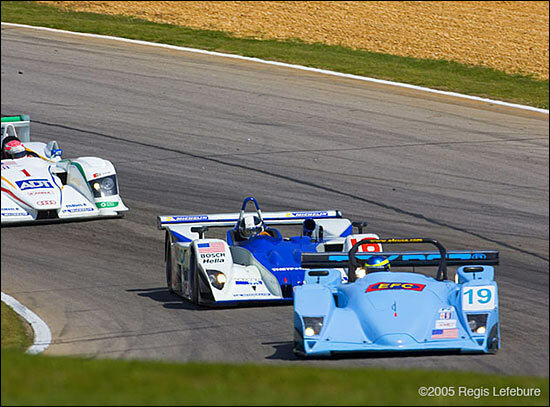 This is the van der Steur B2K/40 at Road Atlanta last April, its first appearance with AER turbo power.